I looked up the definition for “monster” that shows up on google… “an imaginary creature that is typically large, ugly, and frightening.” I find the definition highly inadequate. A monster does not have to be imaginary. In fact, the most powerful monsters are those that exist in a state of doubt. The most powerful monsters are not the ones that we KNOW do not exist, but the ones that exist in the mental limbo between fact and fiction. In the quote of Joseph Smith above, the Trinity (or Triune God) is described as a monster. If one can say that the Trinity is large, frightening, and exists in the uncomfortable place in our minds between fact and fiction, then perhaps we can say that the term “monster” applies. The quote by Smith in other aspects is certainly not very theologically astute (I think even Mormons would have to admit this) but perhaps the term monster is informative of a problem in Christianity. Christianity has often had the Trinity as a litmus test for orthodoxy, and yet has also been strangely embarrassed by the seeming contradictory nature of it. Not all that surprising that Smith took advantage of the discomfort. So How Does One Destroy a Monster? Option #1. Kill It. One can look back to stories like Frankenstein or Dracula (and a host of B-rated monster movies). One can picture villagers with torches and pitchforks coming to kill first, ask questions later. This option doesn’t help us. Regardless of whether God as Trinity exists, killing is simply not a viable option. Option #2. Deny It. How do you destroy chupacabras? Deny they exist. They are only stories. How do you destroy ghosts? Deny they exist. The problem with this, historically, is that some things that were seen as monsters (giant animals of the ocean and land) were denied, only to be shown as really existing years later. Giant squid (and Colossal squid) proved to be very real. Meteorites (rocks falling out of the clear blue sky) were denied by “intelligent folk” until their existence became undeniable. Ghosts and aliens can be removed by denying… but what if they are proved to exist? Denial doesn’t always work. Option #3. Rationalize It. How could Santa exist? He would have to be able to travel at light speed, fit through holes far too small for any obese person, and carry loads around that would crush any roof top. UFOs must be weather balloons, satellites, and mass hysteria. Regarding the Trinity, this is the lead one for many groups. Joseph Smith seemed to be attempting a rational argument against the Trinity. I probably need to add an important note here. When people say that something is irrational, most commonly they mean that it is not “conformed to personal or cultural experience.” When one says that the Trinity is irrational, they mean that 3 persons within one deity is outside of one’s personal experience. Our own experience is 1 person within one being. Sure we may accept the mystery of the unconscious and conscious mind existing and interacting within our own individual self, but we are used to seeing them as aspects of one person, not manifestations of two. Of course, if we encountered a being that unambiguously had an inherent society within one being, as we see in the trinity, we would not find such a concept to be even remotely irrational. To the Romans, the imagery of Janus may well make a trinitarian (or binitarian at least) view seem not so strange. 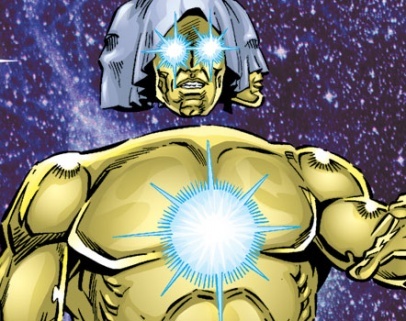 Today, a 3-in-1 being in the Marvel Universe (The Living Tribunal– Equity, Necessity, Vengeance) and a 4-in-1 being in Adventuretime (“Grob Gob Glob and Grod”) provide fictional representations that open up our cultural minds to what is possible. Helps make things less monsterous and culturally irrational. Rationalizing away the Trinity can go in different directions. Mormons go towards a 3-in-3 position. This kind of moves more towards a Hindu-type trinity/Trimurti (Brahma, Vishnu, Shiva) of three divinities that do not exist as a unity in any important way. Some groups (United Pentecostal Church is a well-known proponent) go towards Modalism. God is 1-in-1 because Father, Son, and Holy Spirit are simply manifestations of one God, not three persons. This is like our conscious and unconscious minds as manifestations of one person. Many groups (Jehovah’s Witness and Islam) go towards Radical Monothesim. This is also 1-in-1 but where Son and Holy Spirit are not divine persons. All of these seek to align God with one’s personal experiences. If the Trinity is real and is correctly identified from the Holy Bible, then the Triune God ceases to be a monster through understanding God’s nature. That doesn’t ignore mystery. After all, if God created us in His image rather than we creating Him in ours… it is normal that we do not understand many things of God. But as we understand God as Trinity, He can move away from monster status to a social being who created us and interacts with us. We need to teach the Trinity. But it should be taught not simply as a creedal statement. It should not be taught by prooftext. It should be taught as it is… an outflowing of historical reflection on God’s self-revelation. We need to connect it to other theology. It is not simply a teaching disconnected from the rest. If there is unity of Father, Son, and Spirit, what ramifications does that have? Many imagine salvation as God the Father ready (happily ready) to condemn us to hell, with Jesus (as Son) jumping in and telling Him He can’t because we were saved by the blood of Christ. This is horrible theology (more of a Tritheism than anything else) and certainly is inconsistent with sound Trinitarian doctrine. We need to understand the importance of the Trinity. Why is it important? For me, the fact that God is characterized eternally as love and social/relational (regardless of His creation) is best explained by a unified God who is inherently a social being. We need to avoid our own traps of rationalization or at least overexplanation. There is mystery in God’s nature. While we may recognize God’s Triune nature, we don’t have to be guilty of trying to dogmatically define everything. Mystery is both accurate, humble and intellectually honest.